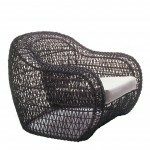 RATTAN HANDWOVEN OVER A POWDER COATED STEEL FRAME. CUSHION REQUIRED. CUSHION SOLD SEPARATELY.